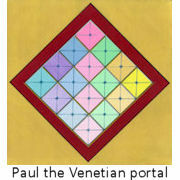 Ascended Master Paul the Venetian is a previous Chohan of the third ray, the pink ray of unconditional love. The current Chohan is Mother Mary.He is here to help us with creativity in all of its forms. He works with artists. Having been an artist himself in his last life as Paolo Veronese, he is drawn to beauty as a form of ascension. Master Paul’s personal path to Ascension was through art, colour, and beauty. He is an advocate of beauty as a pathway to enlightenment- beauty that comes from the heart. He is an Ascended Master but only walks with a few at this time as teacher. You can call upon Paul the Venetian for help with creativity. He will also help in the release of anger from the chakras and bodies if called upon. Here is Paul, the Venetian’s symbol. The symbol is another form of recognition of him. 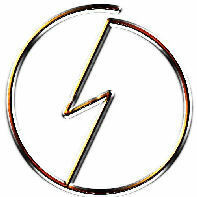 Some people may find themselves drawing this symbol. If so, he is close. Note, it is an open circle; he says it’s one turn of the spiral. You can also use the symbol to call him - place it on your heart chakra and call. Ascended Master Paul the Venetian is working at this time with the Cosmic Master Alpha. 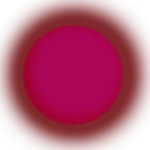 Ascended Master Paul the Venetian's aura has a deep magenta centre with a bronze edge with white. The Masters say, "You will know us by our colours", for they often appear to people not in the image of the body they had in their last life, but in their true form of energy. To the left is Paul the Venetian’s aura colours. If he appears to you in this form, you will recognize him. To the right is an image of Paul in his last life and in a form in which he usually presents. He has strawberry blonde hair and was quite a slight, short man. As a Master of the 3rd ray, he is aligned with the state of Love and works with the Deva of Unconditional Love. The Deva is the animating force of the act of Love. Unconditional Love card. Master Paul painted his gold portal/painting as shown above so his energy can flow from the portal card and portal print 24/7 out towards humanity. It is wonderful to have him sending his energy into a room 24/7 via the print. You may also place the card on a chakra and receive the Master’s energy directly into the chakras. "Silence is a place... it’s that place where a drop of water is suspended before it falls, like that drop of water you see. It’s the place between the in breath and the out breath. And in this silence, there is no thought, no sound. That is the place you strive to achieve in meditation." Concentrate on the breath, at the point when your lungs are full and before you exhale, feel and experience the place between breaths. Now hold that place as you exhale, hold that place between breaths, inhale still holding that place. Keep holding the place between breaths as you slowly breath in and out, renewing your place in the silence.